Hi, Florida Survival Gardening subscribers! Many of you asked if it was possible to continue receiving my posts on a daily basis since I switched over to a new site. After a lot of searching, I finally came across a way to do so. If you want gardening inspiration delivered to your inbox daily, go to the new site at www.thesurvivalgardener.com and enter your e-mail in the box on the top right of the homepage that reads "Subscribe To Posts By E-mail". Hit "subscribe" and you'll be in. Thanks for your patience! I'll see you over there. In case you're still getting updates from this site and haven't seen it - you need to see this post over at TheSurvivalGardener.com! My new book is coming out on Tuesday and I'm GIVING AWAY Create Your Own Florida Food Forest for free on Kindle all week. Important Florida Survival Gardening Update! Read this! If you're subscribed to Florida Survival Gardening via e-mail, it's been moved! Go to www.thesurvivalgardener.com from now on for updates and be sure to sign up for the newsletter. I'm working on a daily subscription as well. Rachel made something delicious a few nights ago. She took chaya greens (which are one of my favorites) and cooked them mixed in with Jamaican sorrel leaves (Jamaican sorrel is also known as Florida cranberry - and in case you wondered: YES, Jamaican sorrel leaves are edible). The tartness of the Jamaican sorrel meshed excellently with the hearty flavor of the chaya, making a really tasty mess of cooked greens. The bed above was planted this spring and bears more leaves than we could ever consume - and later in the year, it will bear the delicious tart red calyxes used for cranberry sauce, mixed drinks and teas. Quite a versatile plant. We find the leaves a bit too tart for the main part of a salad, but mixed in with a few other greens they have a refreshing bite reminiscent of a good balsamic vinegar. Rachel is still working on her "strange vegetable" cookbook and these greens will definitely be in there. Stay tuned. SIGN UP for the Survival Gardening Newsletter! 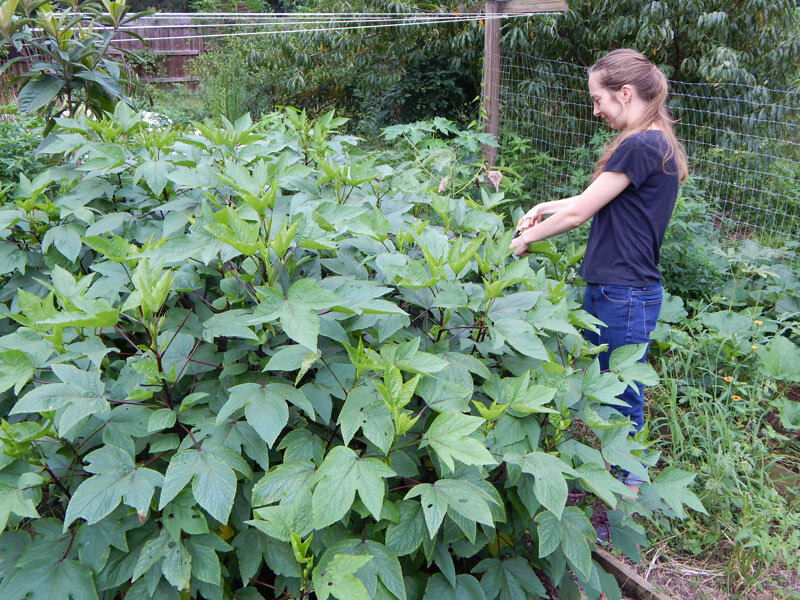 Today at the 326 Community Market: Large-fruited PawPaw Seedlings! I was very fortunate to be able to purchase fresh pawpaw seeds last year... and get them to germinate. ...but all that is over now. 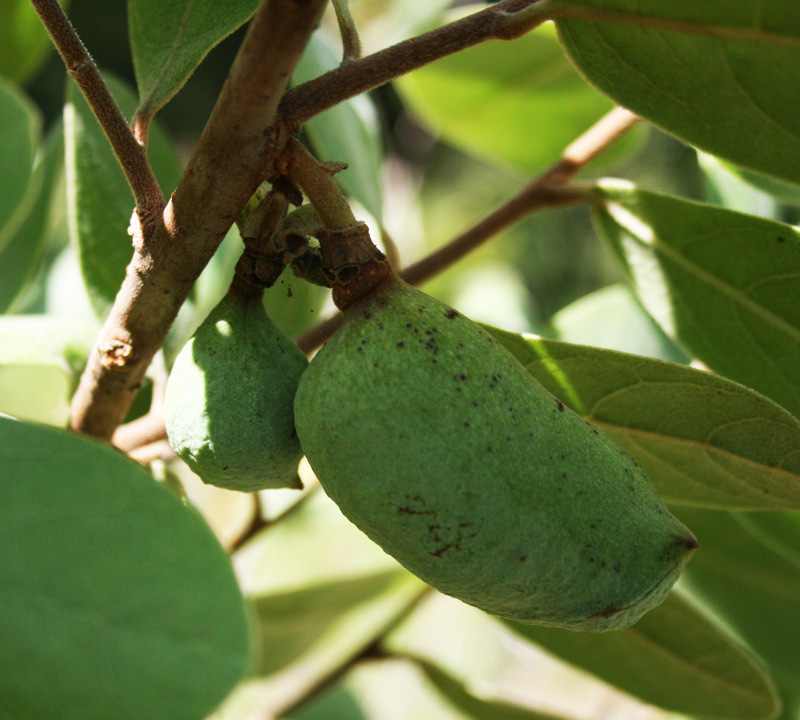 I now have a bunch of little pawpaw starts - Asimina triloba to be precise - and I'll be selling them for $5 each this week at the 326 Community Market. These are NOT the little scrub pawpaws with the tiny fruit - these are the big tree type with large, tasty fruit. 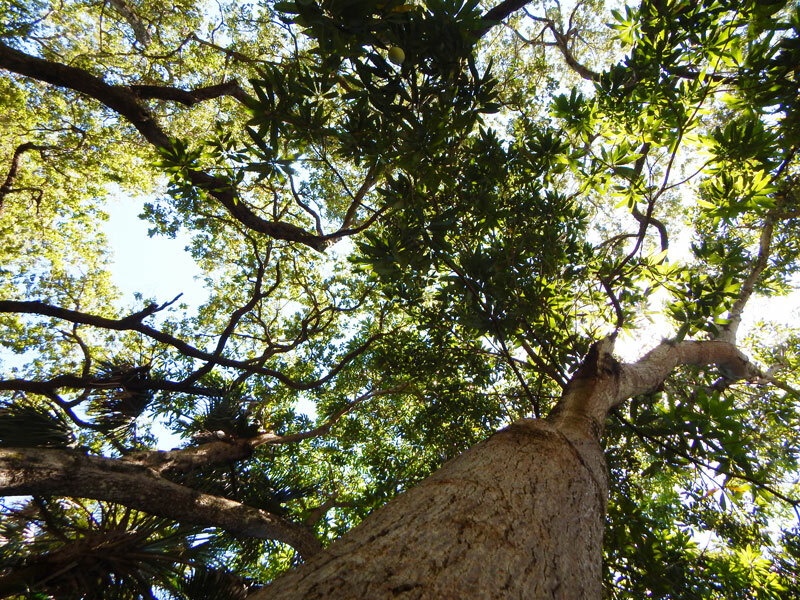 We're at the bottom of their native range, however there are trees here that set fruit. If you have a shady spot, pop a few of these in. I recommend buying at least a couple of them or else you're not likely to get pollination. Beyond the pawpaws, I'll also be bringing some larger and rarer plants - perhaps even a big fruiting coffee tree - so stop on by. 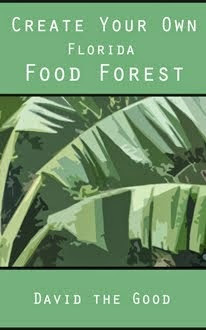 As always, I'll also be selling copies of Create Your Own Florida Food Forest for $7. 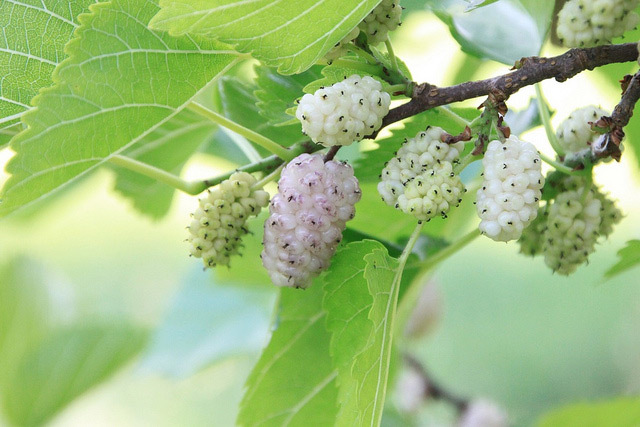 And I still have some white-fruited mulberries left, so come and get 'em. Google map is here. Their Facebook page is here (with lots more photos and info). My prices are good and my gardening advice is free. See you there! 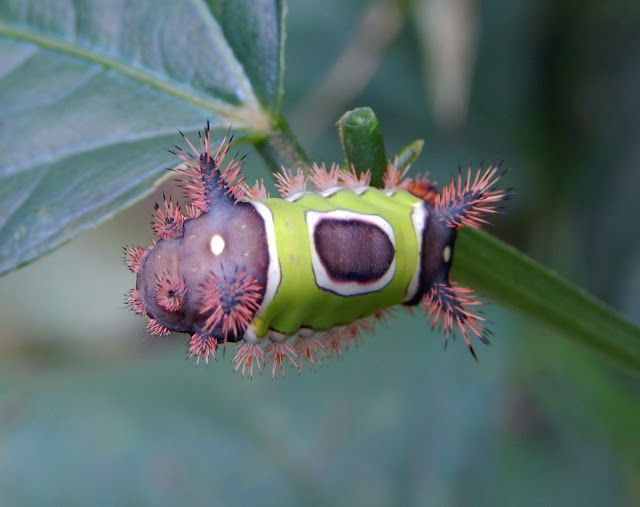 Another Florida Stinging Caterpillar: The Saddleback Caterpillar! Look at those amazing spines. Aren't they something else? I'm a bit of a sucker for dangerous animals and plants... and this one is no exception. 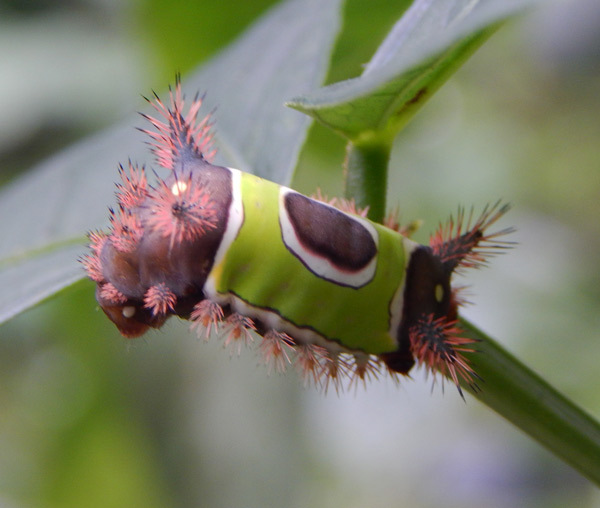 I've previous written about Florida's stinging puss caterpillar... today we'll take a look at this week's visiting stinging caterpillar. This lovely stinging caterpillar was discovered on one of my yard-long beans by the children. Fortunately no one bumped into him. I love the way the saddle looks - really a beautiful creature. The spines are also lovely. The saddleback caterpillar is like a little stinging assault vehicle. They don't really do much damage to plants, fortunately, so I just leave them alone to grow up into moths and fly off to go make little stinging babies. Florida is truly a weird and wonderful place. 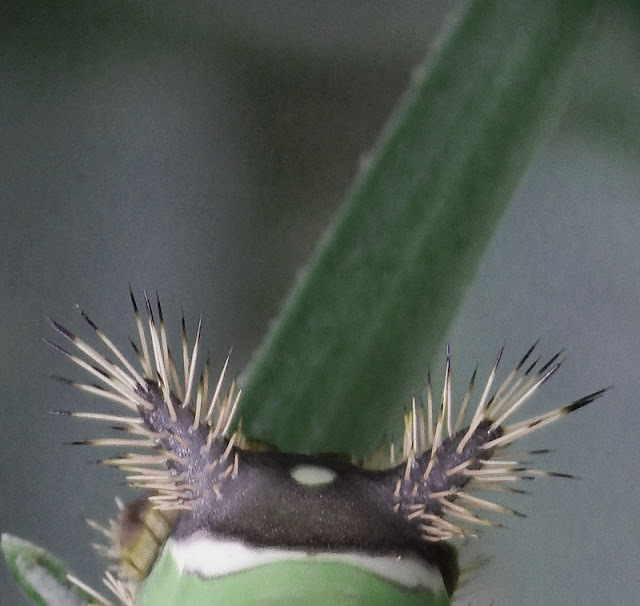 Even our poisonous caterpillars look cool. 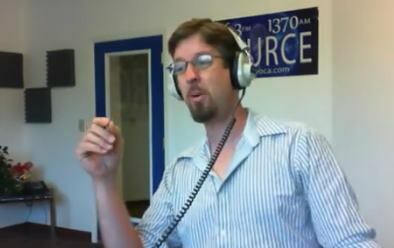 WOCA Interview 7/21: Pumpkins, Weird Beetles, Composting and More! Monday morning on In The Garden with Carol Ann Baldwin, I'll be joining Larry Whitler and filling in again for Carol Ann. Call in - we'll be talking gardening, Compost Everything and whatever else folks want to talk about. You can catch the show live online here or tune in via 96.3FM or 1370AM in the Ocala area. The call-in number is 352-622-9622. Later on in the day I'll post the YouTube recording of the show. Happy Monday: here's a video of a Florida flatworm! I was eating breakfast on the back patio with my wife recently when I noticed something really cool creeping between the cracks of the bricks... and I caught it and put it on the table so I could film some footage. You don't see those every day. It's a tiny little thing. I decided to add my song "Worms" as a soundtrack. It seemed appropriate. If you really want to suffer, you can find the complete album here. My favorite tracks are The Superman Song, Eye of the Hurricane and Publix... though I think they're all cool. I am, however, quite biased. I've also been reliably informed that I have "terrible taste" and that my music has "no commercial value whatsoever." 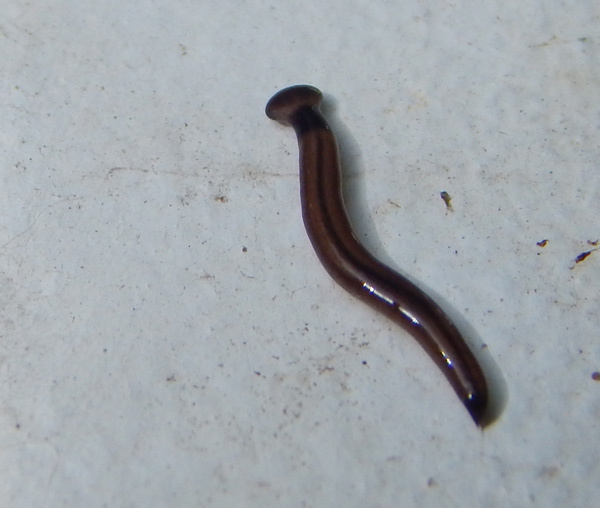 As for this cool little flatworm... you really never know what you'll find crawling around in a healthy ecosystem. Today at the 326 Community Market! White Mulberries! Turmeric! I'll be at the 326 Market this afternoon with plenty of interesting bits and pieces, including little white-fruited mulberry trees. Along with white mulberries, I'll also have turmeric plants, goji berries, various fruit trees, perennial vegetables and all kinds of cool stuff. 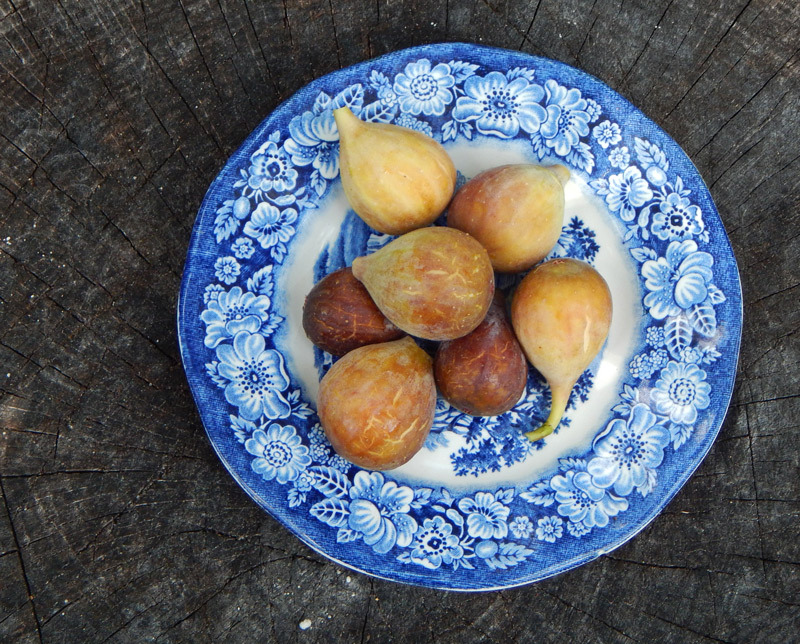 The figs are falling off the trees here at Econopocalype Ranch. My trees are now about 4 years old and one of them has really come into its own. We've been eating figs daily. I thought my tree was a Brown Turkey but judging by the fruit I now think it's a Celeste. They look too golden in color to be Brown Turkeys. I started this particular tree from a cutting and over the last few years it's grown from a foot tall to ten feet tall. I'd say we'll get at least a gallon of figs total off the tree this summer. As it gets bigger the harvests will as well - this is the first year it's given us more than a handful. The children are loving them and I love letting them have a couple every day. If you don't have a fig tree, what are you waiting for? This is a delicious and exotic fruit. Pick one up and start growing your own. They taste like honey with a floral bouquet fresh from the tree - and dried they're even richer. The trick is to pick them as soon as they droop. This means checking the tree every day. Wait and the bugs will get them. Too early and they taste like latex. But when they're soft, ripe and drooping... they're heavenly. See those fruits? In case you grew up in a blighted Yankee hellhole (spits) and don't know what those are, those are mangoes. They are one of the most incredible and delicious fruits on the planet. If you live in an aforementioned Yankee state and have bought them in a grocery store, you don't know what they taste like. They're terrible from the grocery. Sweet-sour with a turpentine undertone. Those are not the mangoes we have in Florida. The mangoes in Florida, or more specifically SOUTH Florida, are rich, sweet, tropical, bursting with flavor and absolutely addicting. A Master Gardener in North Florida once told me that they loved the oak woods in North Florida and really thought South Florida was sad because they didn't have towering oaks. I responded, "Oaks? 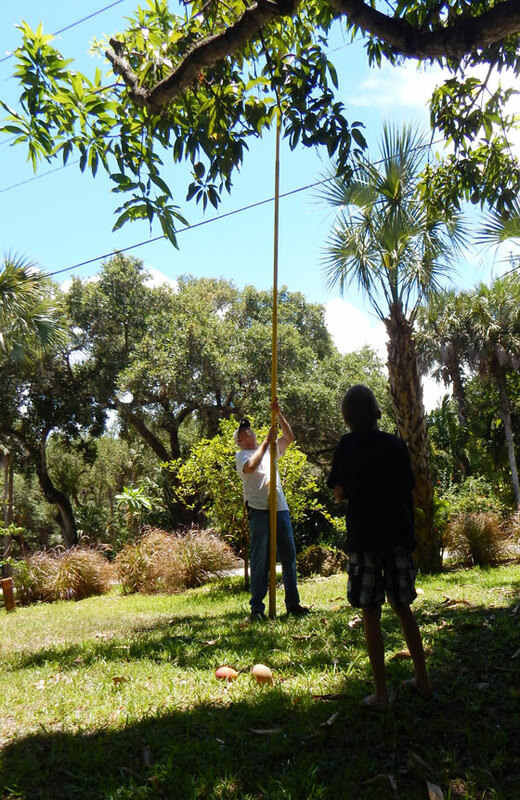 In South Florida, the MANGO TREES are the size of oaks!" Those are 50-60' mango trees. They are absolutely incredible. These particular trees are growing at my in-laws' house. Long ago, a man planted a small orchard of mango trees in his yard... then sold the house to my mother-and-father-in-law, and the trees just kept on growing... and growing... and growing. That's a massive telescoping pole used to change fuses on transformers. It's a serious fiberglass tool with a hook on the end. A mango hook! 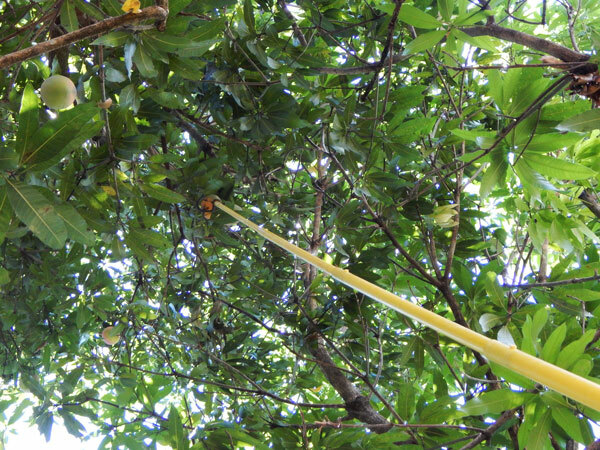 The trick is to catch the falling fruits... or eat them quickly if they smash into the ground. I admit: I did badly at catching the fruits the day I took these pictures. 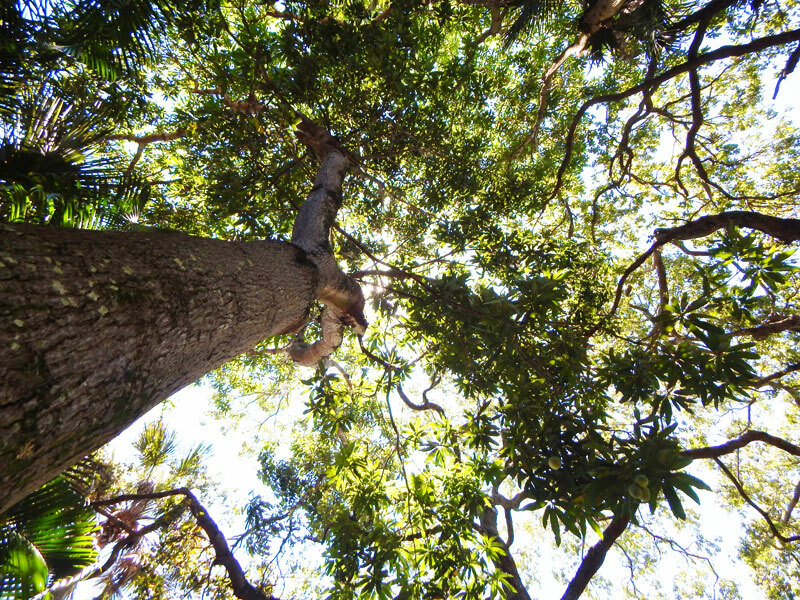 The tropical sun was high in the sky and as they fell they bounced all around the branches unpredictably. I was also a little concerned about getting brained. 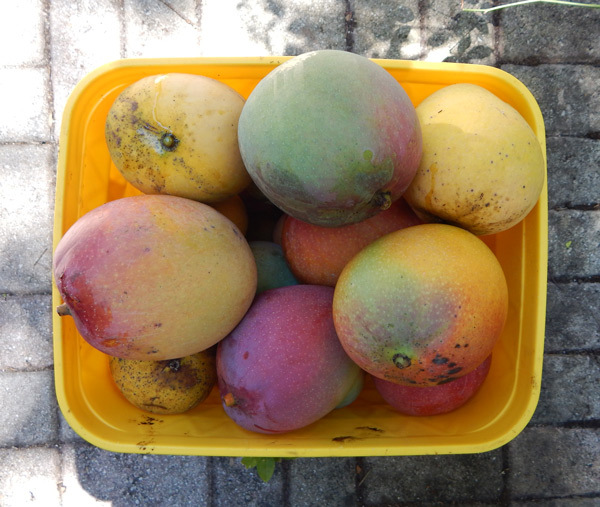 But, in the end, we gathered a couple of lovely buckets of mangoes, God's gift to Floridians. Though mangoes can't take the winters where I live, I do get to visit the trees down south now and again. I'll take that... especially when I get to eat their fruit. In April I undertook an experiment: I grafted pear scions onto a hawthorn tree growing at a friend's house. My original post on this experiment is here. Out of the many grafts I undertook, four seem to have stuck. 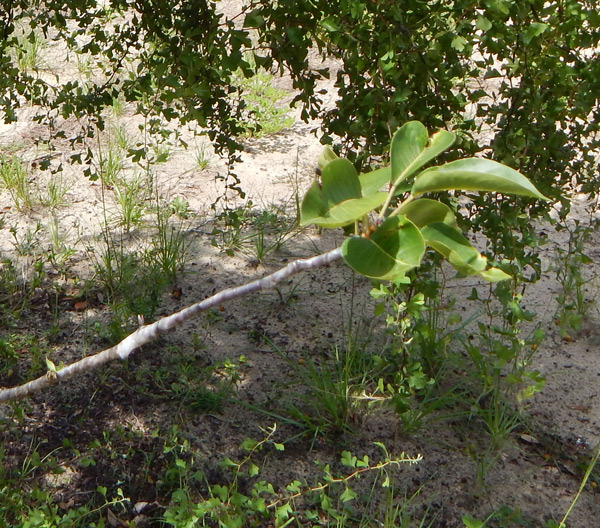 The interesting thing about this: if the pear scions keep growing and work out, they'll be growing in a place that's rather inhospitable to most decent fruit trees. This is some hot, sandy, dry scrubland. The hawthorns can handle it, so as a rootstock they should really do well. We'll see how things turn out long-term but I'm encouraged to see these guys growing so far. Bonus: this is a chicken coop made of pallets. Pallets! That's cheap and strong. The problem with many chicken tractors is that they're not predator-proof. I've gone from free-ranging birds to keeping them totally locked up to experimenting with tractors to building tougher coops to again building tractors... but Allan's pallet chicken coop is a great design. I also like that it's modular. You can build it in pieces, then bolt it together, provided you can find the right-sized pallets for your chicken coop design. We should write up some plans! I was impressed. Here in Florida, predators are always a problem. I've lost more chickens to racoons, possums, hawks and even snakes than I care to mention. It's all well and good to talk about the "natural" way of letting them run around the yard, but at the end of the day, homesteaders are keeping chickens for eggs and meat - and chickens are a tasty prey animal. If they aren't completely protected in a predator-proof coop, you will lose some - or all - of your birds. Putting hardware cloth all the way around may cost some cash but it's better than coming out in the morning and finding out that your birds have been decapitated and strewn around the yard. Been there, seen that, hated it. Never again. A safe, tough, pallet chicken coop like this one is a great idea and I thank Allan for sharing it with us!